When was the last time that you did something for the first time? We can’t remember and if you can’t either, here are some hobby pottery classes that will help you change that. A few hours out of the weekend, and you’d have learnt a new skill, have had something to take back home and had a positive answer to the question we just asked. Let the handwork begin! 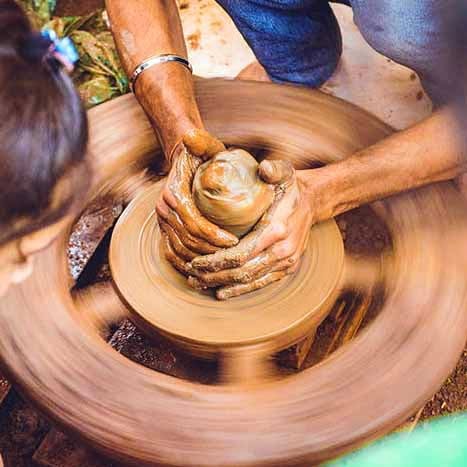 This studio in Mahim is run by a self-taught potter, who's known by the name of Shalan Dere. She specializes in ceramic home decor pieces. When you enter her abode, you're taken to a magical world of figurines, pots, vases, sculptures, and much more. She churns out her clay in the garden area, and conducts workshops for people on request. You can call her on 9773095005 for discussions on the workshop cost. This is a lovely space in Bandra, quite like the eponymous potter lab, with a wooden table in the centre where you are cut off from the world. Here, you can just give yourself and your newly-found craft some time. At the Pottery Lab, by Rekha Goyal, sign up for a beginner’s course which would be 10 days long. You will learn hand-building, working at the potter’s wheel, decoration and application of glazes. Get in touch with her on 919833058151, and book your slot. For INR 12,000, you sign up for some comprehensive learning in pottery. Don't miss out on it. Looking for a hobby class in Andheri? The classes held by Mitty Raja are a good option for you. A basic course for adult beginners is of 15-hour-long duration which you can do over a few weeks' time. And the course is priced at INR 6,000. He only takes two students at once, making sure someone’s eye is really over your shoulder while you’re new at this craft. Call him on 9324626697 for more details. Meeta Suraiya is a housewife and takes her passion for pottery quite seriously. She teaches this art form to people at her home in Goregaon. You can either take a one day workshop for INR 1,200, or you can sign up for regular classes, for INR 800 per class. Economical, and educative, this one's a perfect fit for if you're on a budget.